At the end of every album Dutch female fronted symphonic rock band Delain is organising a unique show with an extra long setlist and special guests. In the past the band played these shows in their hometown at the Broerenkerk but since that has been turned into a bookstore the band moved to a new location for their last We Are The Others show entitled Delain presents My Masquerade. We Are The Others has been the third album by Delain and due to some label issues it has had a quite problematic cycle. Nonetheless the band found a new home with Napalm Records and released a compilation of exclusive material and bonus content entitled Interlude earlier this year. Tonight was supposed to be the night to close this period and start their next adventure. Before the show masks were handed out to people not yet wearing them and there was a big white curtain in front of the stage. After a short intro and shadows of band members projected on this canvas the curtain drops and the show is on its way. The almost two hour performance showed the capabilities of the band and the experience they have gathered over time. With Charlotte Wessels being at the focus of attention she non stop interacts with the audience asking them to cheer, clap and sing along. Sometimes this even becomes a bit annoying but the crowd does not seem to care to much about this. During the set the crowds get pleased with a variety of all albums by the band. From Pristine, Sleepwalkers Dream, The Gathering coming from the album Lucidity to April Rain, Virtue and Vice and Control the Storm from April Rain and We Are The Others (twice), Mother Machine and Milk and Honey from We Are The Others. Also Cordell, one of the covers by Delain, gets played with guest (and former) guitar player Ronald Landa. Other guests who appear during the show are Marcela Bovio (Stream of Passion) and Georg Neuhauser (Serenity). 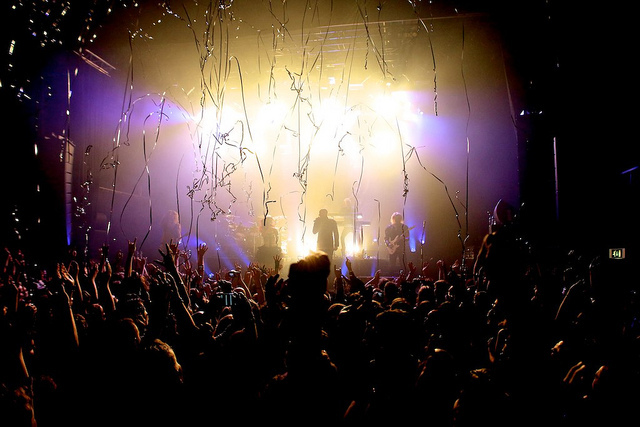 In a sold out Patronaat Delain could not have wished for a better end to this album cycle. The crowd keeps cheering long after the band leaves the stage and afterwards the bands join their fan base for a long signing session. Now the fans just have to wait on the next Delain album which should be release somewhere in 2014.